The Monterey Jazz Festival on Tour 60th Anniversary Edition features a prime roster of diverse, international millennial talent leading the future of jazz. 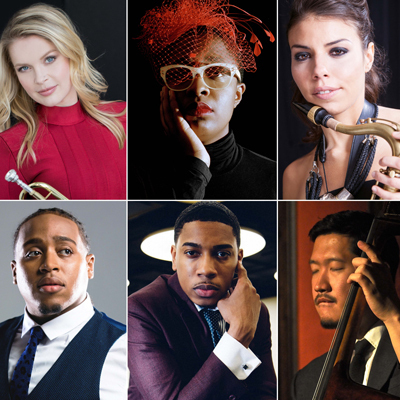 Starring Grammy Award-winning vocalist Cécile McLorin Salvant and featuring Bria Skonberg, Melissa Aldana, Christian Sands, Jamison Ross, and Yasushi Nakamura, Monterey Jazz Festival holds the distinction of being the longest-running jazz festival in the world. This exclusive presentation celebrates the Festival’s legacy expanding the boundaries of live jazz performance. Co-curated by Larry Dwyer, Director of Jazz Studies.